Irish rockers U2 have signed a 12-year deal with concert promoter Live Nation to handle the band's merchandising, digital and branding rights. 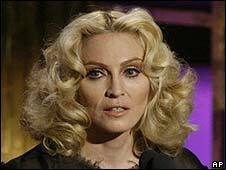 The deal follows the ground-breaking recording and touring contract Madonna signed with the company last year. U2, however, will continue to release records through Universal Music. "We've been dating for over 20 years now," said singer Bono. "It's about time we tied the knot." Live Nation has managed U2's tours since 1980. Madonna's deal with Live Nation, which brings to an end to her 25-year relationship with Warner Music, has been reported to be worth $120m (£60m) over 10 years. "U2 has created some of the greatest rock music of all time," said Live Nation chairman Michael Cohl. "It has long been our intention to consolidate and extend our relationship." Live Nation will continue to manage U2's tours and collaborate with the band on its official website. "We feel we've got a great website but we want to make it a lot better," said Bono. 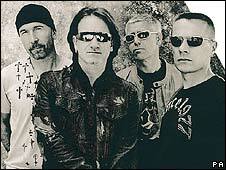 "U2 are doing their best work right now, on record and in concert," said the band's manager Paul McGuinness. "The opportunity to integrate U2 and Live Nation's vision of the future is a great extension of our established business." With the decline in CD sales across the globe, artists are increasingly looking at so-called "360 degree deals" that combine their recording, publishing and touring revenues.